Audrey holds a Bachelor of Music degree from the University of British Columbia and a Master of Music degree from the University of Victoria. She had further cello studies with Kurt Engert at the Richard Strauss Konservatorium in Munich, Germany. She has also studied the Suzuki method with many renowned teachers such as Bill Starr, John Kendall and Tanya Carey. A devoted teacher and mentor, Audrey has taught cello and music history at the Victoria Conservatory and at Capilano University and now maintains a full teaching studio at VAM where she has been a core faculty member for many years. 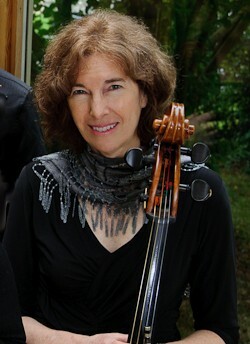 In addition to her regular teaching and performing activities, Audrey has taught at numerous workshops, Suzuki Institutes, summer music camps and festivals throughout North America. A previous member of the Victoria Symphony Orchestra, Audrey now performs with the Pro Nova String Quartet (www.pronova.ca). She has been a member of this ensemble for over twenty years.